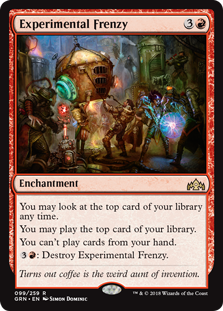 Mike thinks Experimental Frenzy is a Necropotence-esque card. What does he mean by this? To Mike, Experimental Frenzy is going to inform both deck design and in-game play. Like Necropotence, the Frenzy is going to offer a relentless stream of card advantage limited only by how much land you have in play. Sadly, this is a true story. Dismissive Pyromancer – A Human Wizard, this card synergizes with the Wizard’s Lightning you’ve already got. The Pyromancer can shoot at large creatures but also change the top card of your library under Frenzy. Treasure Map – An amazing tool against mid-range and Control decks, Treasure Map is one of the best possible cards to have in play while under Frenzy. It can help you dig to what you need early, then keep your gas going late. Field of Ruin – Mike is currently sideboarding this card as his extra land. Not only does it have text against stuff like Azcanta, the Sunken Ruin; it can change the top card of your library while you are under Frenzy. Risk Factor – a new card from Guilds of Ravnica, Risk Factor can be played from the graveyard while you are under Frenzy, often changing your top card. For next level performance, try discarding Risk Factor to your Risk Factor. Boros Angels – Find out about the new home of Lyra Dawnbringer and friends. G/W Tokens – Mike claims this is the most powerful initial deck in the format. Blue control (various) – Get ready for a change of pace!